This customer had a stone driveway but they were having some drainage issues. 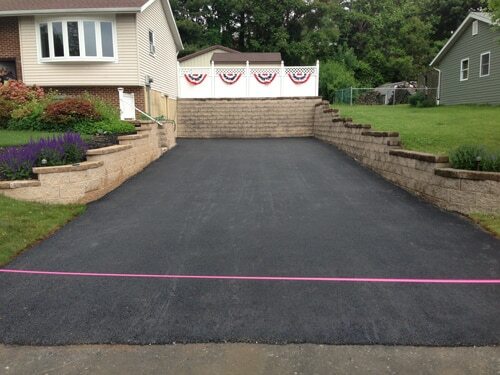 They realized an asphalt paved driveway was the way to go. We regarded the stone for proper water drainage to ensure the slop was away from the house. Then we applied 3 inches of hot asphalt. All sides were made level by all retaining walls. It is suggested to put sprinklers and watering hoses far from newly paved asphalt driveways. Also, giant or previous trees ought to be removed to shield new asphalt from tree root damage. even though the tree appears like it’ll not be a threat, it’s safer to get rid of it before experiencing asphalt damage from underground root systems. As soon as you see a pothole or crack seem, it’s recommended to take immediate action to stop additional wear and tear. the earlier an asphalt issue is acknowledged and stuck, the less expensively the repair can cost.